How did you get interested in railways and railway history? I come from a railway family. My father and his brothers were all railway workers, which is why the railway has been part of my life since childhood. I started working at RENFE at eighteen and then joined the Spanish Railways Foundation, while I combined my working activities with my university studies in Geography and History. Years later I was very lucky to start working at the Library and the Historical Railway Archives and, therefore, to be very close to documentary sources on the history of railways in Spain. My interest in historical research allowed me to join projects that began to be implemented in the late 1980’s by our Foundation. My early work focused on Latin American railways and specifically on the cases of Chile, Colombia, Ecuador and Venezuela in a project led by the historian Jesús Sanz Fernández, who helped me and provided me with my first guidelines to undertake historical research work. 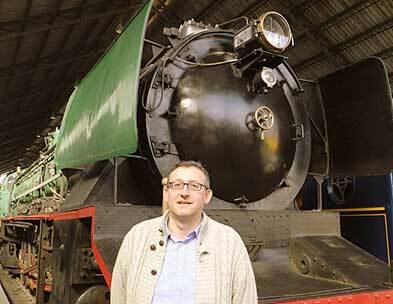 How do you manage to be a scholar and to be subdirector of the Museum of railways in Madrid? Do you have time for research? It is very difficult to combine management work with ongoing research and even more so if it involves a doctoral thesis. The management of the Museum now occupies all my time. The doctoral research, which focuses on the employment purging process involving railway staff during the Civil War and the Franco regime, is progressing slowly due to that lack of time, but with a great desire on my part to conduct and complete it. What is the role of Renfe in Spain in the history of railways? The public company Renfe was established in 1941, in the early years of the Franco regime, and only two years after the end of the Spanish Civil War. Its continuity to this day as a company allows us a closer study of economic and social progress in Spain during the Franco period and to know about the relevant transformation experienced in the Spanish railway from the restoration of Democracy and subsequent integration into international organizations such as the European Union. Our museum director, Miguel Muñoz Rubio, is the foremost specialist in the history of Renfe. His doctoral thesis, entitled RENFE, half a century of public railway (1941-1991), is an essential reference in order to understand much of the history of railways in Spain during the twentieth century. What do you think about the history of railways in the history of mobility and within T2M? I think that it plays a major role. The railway was the mode that led the revolution in the transport system during the nineteenth century and it held that position until the emergence of the car. It is therefore difficult to write about the history of mobility without taking that role into account. It is also true that those of us making railway history must look to other modes and take them into account in our analysis. Therefore, the role played by the T2M is very important to put everything into perspective. It allows us to broaden our perspectives and to know the similarities and differences that each mode has had in the evolutionary processes. Is there a specific Spanish way of writing the history of railways? Any specific themes? The topics currently addressed are increasingly diverse. A good indicator to check this evolution is the content of our railway history conferences at http://www.museodelferrocarril.org/investigacion/congresos.asp. Papers submitted since the first edition of the 1998 conference reflect how social, urban development, technological and heritage issues have occupied an increasingly important space. However, in my opinion, historical economic analysis remains the dominant theme. Regional railway history has also been increasing. In this particular area, I consider that the work carried out following the Railway History Programme at the Madrid Railway Museum to be essential as it constitutes one of our regular lines of research. You are the secretary of the journal [TsT]. What are the topics of this journal and why would you say that it could be of interest for T2M members? [TsT] is a scientific journal that has now existed for ten years and specializes in all activities related to the tertiary sector (transport, commerce, banking, communications or public services, etc.). [TsT] has a clear international vocation, without setting any geographical limitation to the studies published, or the language of their dissemination. We believe our www.tstrevista.com publication may be great interest to all T2M members. That is why I am encouraging you all to get to know it, to send us items for evaluation and encouraging you to subscribe individually or to propose this to your university institutions or departments. Among your various activities, you are one of the local organizers of the next T2M conference, in Madrid. Is it a lot of work? Can you describe how you are organized and who is involved in this event? In addition to publications related to my Ph.D. thesis, I’m currently reading the work by Alfred Williams entitled Life in a Railway Factory, which is about the poet’s working experience during his time as a worker at the Swindon railway factory, which belonged to the Great Western Railway, before the start of the First World War. I am alternating this reading with the book El corazón helado by the Spanish novelist Almudena Grandes, a novel about the economic and social consequences of our Civil War (1936-1939) in two families.